Hello dear, my name is Deh, I am a content writer with over 10 years of writing and publishing experience. Over the years I have developed various other skills including blogging,...Read moreHello dear, my name is Deh, I am a content writer with over 10 years of writing and publishing experience. Over the years I have developed various other skills including blogging, editing and proofreading. I am also a great web developer with over 25 projects to show for it. 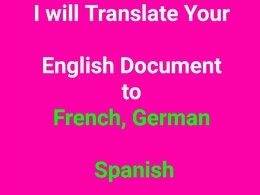 I am fluent in 3 languages including French and Spanish. Kindly leave me a message and I will be more than happy to help. Deh C is one of the most cooperative and understanding writer I have met on this platform her dedication and support to her recruiters is impeccable. Thanks for the great work. Oh thank you so much dear Hashim. Great working with Deh! She is very fast. Work is very good and she also very nice communication with me. I give her 5++ stars review. Finally, I am fully satisfied with her work. Well...even after showing you I was sick for days. You still have the heart to speak negatively about me. It's alright, your conscience will judge you. Computer? No ma'am...I translated a scanned PDF file word for word. Very smart, I recommend to work with. Very great job, work and reply fast. Copy proofing and amending current text. Thank you so much dear Ben. Great job done, thanks just hat I was after. Great attitude, very friendly and replied very fast. What i asked was very tough job, and required a lot of research and Deh really was able to understand all the information and deliver very quickly. Oh thank you so much dear Nick.